Vintage Computer Festival — five events this year! If you’re looking for novel ways of inspiring students, then consider giving them some hands-on exposure to the past at a Vintage Computer Festival event. Vintage Computer Festivals are a series of family-friendly events celebrating computer history. The event formed in the 1990s and gradually spread to other parts of the country and into Europe. Each event has an exhibit hall where anyone can see and try out historic computers from the 1960s-1980s. There are also keynote speeches by celebrities and VIPs, technical classes, tours of nearby museums, consignment sales, and more. Upcoming editions include VCF East (April 15-17, New Jersey) and VCF West (August 6-7, Silicon Valley). Children enter free for most of the event. These events are the only place where your students can see things such as a 1960s DEC minicomputer, 1970s systems such as an Altair 8800 or Apple-1, and all manner of 1980s eight-bitters — all up-and-running. Take a learn-to-solder class, play a round of Zork, see a UNIVAC mainframe, and learn how to load BASIC from paper tape.There’s no better way to make students appreciate modern smartphones than to see an 800-pound Cray supercomputer or boot a Commodore 64 into a flashing cursor prompt. The series producer is Vintage Computer Federation which is a 501(c)3 educational non-profit. In addition to the shows, the Federation also owns the Vintage Computer Forum online discussion site, incubates regional chapters, and operates its own hands-on computer museum. We shine a spotlight on CS education for students each December during CSEdWeek. Why not do the same with a perennial offering for CS professional development for teachers? After all, professional development has long been recognized as one of the key ingredients in CS education. Bringing even one PD provider to train a handful of teachers and counselors in a small district is prohibitively expensive, and even the smallest school district will need multiple solutions to implement the dream of CS4All. One way to solve this problem is with grants and sponsorships, subsidizing local workshops for a handful of teachers at a time. However, this only solves part of the issue–even with limitless dollars, scheduling constraints make it extremely difficult to bring multiple providers in at the same time. This makes it nearly impossible for most districts to adopt the broad mix of offerings that are necessary to increase diverse participation in computing. In other words, coordination can be just as large a bottleneck as funding. CSEdWeek is a model for coordinated advocacy. Schools in a district, in a state, and across the country effectively leverage funding and volunteer efforts at the same time every year. It’s time to do the same for professional development, and this is the impetus and foundation for CSPdWeek. The first annual CSPdWeek is this July 18th-22nd, 2016 – find out more at www.CSPdWeek.org! An inaugural event, offering PD from Bootstrap, NCWIT Counselors for Computing, AP CS Principles, and Exploring Computing Science will be held during the week of July 18-22nd at Colorado School of the Mines. The event is sponsored by the Infosys Foundation USA, with additional support from the National Science Foundation, The National Center for Women & Information Technology, and the Computer Science Teachers Association. We invite teachers and counselors from across the US to apply for full funding (covering travel, food, lodging and PD), with an emphasis on those working in high-needs schools. Join nearly 300 educators from across the country, and spend the first CSPdWeek with us in Golden, Colorado! Can’t make it to Golden? That’s okay! CSPdWeek is for everyone, and we encourage other PD providers to offer their own professional development events during the week. Professional development matters, and will be a crucial component of CS4All. By staking out one week during the summer, and coordinating our efforts, we can amplify the impact of everyone in our community. It’s going to be an incredible summer, and we hope you’ll join us in celebrating CSPdWeek 16! DRAFT 2016 CSTA K-12 CS Standards: We Need Your Feedback—Again! Much excitement and activity continues to take place in the K-12 Computer Science Education space. The K-12 Computer Science Framework and the Computer Science for All initiative started by the White House both continue to evolve. Many states and school systems are working to implement computer science into their curriculum. And, the CSTA K-12 CS Standards Revision Task force continues to refine the draft 2016 CSTA K-12 CS Standards. Thanks to all of you who took time to provide us feedback on the draft 2016 CSTA K-12 Computer Science Standards during the first review period. We received many great recommendations and comments about the standards. The CSTA K-12 CS Standards Revision Task Force members met in person on March 5 and 6 to read and analyze the feedback that we received. They have been diligently working to revise the first draft of the 2016 CSTA K-12 CS Standards to reflect the feedback. The second DRAFT of the 2016 CSTA K-12 CS Standards is now ready for public review and feedback. We need your assistance once again! Please take some time to review the revised 2016 draft standards and complete the 2016 CSTA K-12 CS Standards Feedback Form. This will provide the CSTA Standards Revision Task Force members with additional constructive feedback that will assist us as we seek to refine the standards and make them most useful for K-12 educators. You will have the opportunity to give us detailed feedback on individual standards in each of the grade levels (Level 1, Grades K-5; Level 2, Grades 6-8; Level 3A, Grades 9-10 (for all students); Level 3B Grades 11-12 (enhanced standards for students who wish to further study CS). You will also be able to provide feedback on all the standards for a grade level within a concept area. Feedback for this second review period will be accepted from April 6 through April 20, 2016. The task force members will analyze this feedback and further refine the standards as needed. CSTA is committed to an iterative process that allows multiple drafts and revisions before publication. Our goal is to release the interim 2016 standards at the 2016 CSTA Annual Conference. We want your feedback. We need your assistance. Please thoughtfully complete the CSTA K-12 CS Standards Revision Feedback Form. This second round of feedback on the standards will be accepted until April 20, 2016. A team at Google developed a template for lessons which would be made available on their site. They took the large number of lessons that were already on their site and rewrote them into this new lesson plan format. They hired a group of educators to review all of those lessons and now have about 130 lessons and other materials available. These lessons have specific plans, are interactive and inquiry-based, and include additional resources. There are lessons in 17 subject areas mostly in math and the sciences. These lessons are also cross-referenced to various sets of international standards (Common Core, NGSS, CSTA K-12, and standards from UK, Australia, New Zealand and Israel). At about the same time, another Google team developed a group of six videos called CT@Google which focus on the Seven Big Ideas from the CS Principles course, and how Google uses them in their work. All of these are quality resources. Disclosure: the author was compensated by Google for assistance in editing the collection of lesson plans mentioned in this article. 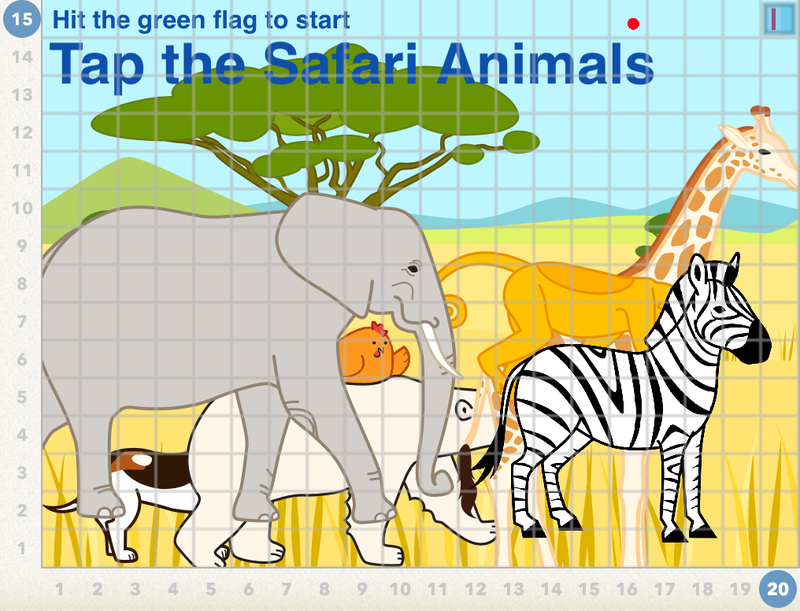 ScratchJr is a popular graphical programming language that allows children from age five to seven to create “interactive and animated scenes and stories” . It addresses the lack of programming tools that focus on “content creating or higher level thinking”  for kindergarten to second grade students. ScratchJr software deployment comes with the curriculum and online community, and the design goal of the ScratchJr software is to “provide young children with a powerful new educational tool as well as guidance for teachers and parents to implement it to the benefit of diverse areas of early learning, from math and literacy to interdisciplinary knowledge structures” . Fig 1 shows a sample project of a game that has the progress dot which starts at row 15 and column 16 and has a red bars at row 15 and column 20. As the game progresses, the red dot moves towards the red bar. When the red dot reaches the red bar, the player is greeted by a “You Win” scene. Along with the achievement tracking, this game also tells a story about animals, particularly the taxonomy of the animal kingdom. The storytelling aspect of the games always draws students in, motivates, and inspires them to create their own games with storyline. And this creativity has to be integrated into the lesson plan. 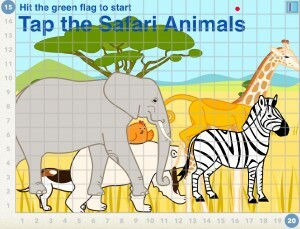 Please see and download the Safari Animal lesson plan at http://scratchjr.zatna.com. ScrachJr is a great platform for younger kids because you can create exciting games with the progress tracker using fewer code blocks than Scratch or other block programming environments. We hope that ScratchJr team maintains and updates it regularly and more K-2 teachers as well as Pre-K environments will adopt ScratchJr. Our paper, “Teaching and Learning through Creating Games in ScratchJr: Who needs variables anyway!” will be published in this month as part of the proceedings of the Blocks and Beyond Lessons and Directions for First Programming Environments A VL/HCC 2015. Computer programming in K-12 education has become increasingly mainstream in the U.S., especially with the excellent work being conducted by groups like code.org, Project Lead the Way, CSTA, and many others. These trends have been happening for many reasons, not the least of which being a growing awareness of competition from abroad and the well known shortage of professionals in the field (a problem we are acutely aware of in Las Vegas). In this blog post, I will discuss work on the Quorum programming language, the first, so-called, evidence-oriented programming language. By our current count, Quorum is taught in approximately 34 K-12 schools in the U.S. From surveys, we estimate over 1,800 students will be taught Quorum next year. and be fine with it, this is typically translated into speech for the blind. While there is no perfect way to write this, readers are encouraged to say out loud “for left paren int i equals zero semicolon i less than ten semicolon i plus plus right paren left brace right brace.” Similarly, compiler errors when translated to audio can be difficult to understand. A trivial error (e.g., missing a variable definition in C++), might take a minute or two to “listen” to. Mainstream students have difficulty with these things too, but they are exacerbated in students with disabilities. After making these observations, I concluded that one obvious way to approach making programming easier was to improve the tools (e.g., talking debuggers, accessible editor hints, accessible completion, accessible code folding). I invented all of those things (most are in Sodbeans, a tool for the blind used throughout the U.S. today), and they do seem to help, but C itself is still hard to “listen to.” Ultimately I couldn’t get this nagging question out of my head, “What was the evidence for the design of C to begin with?” So I began to investigate, but weirdly … I could find little human factors evidence in the academic literature. Let’s briefly discuss this history. First, it was not always the case that medical practitioners, psychologists, and others used experiments in science. In medicine, the techniques started largely in the late 18th century after Louis XVI created a commission to study the bogus theory of animal magnetism (mesmerism). Benjamin Franklin, the head of the commission, used the idea of “sham treatments” to uncover problems with this (bogus) theory. As science progressed, techniques became increasingly rigorous. Scientists used primitive placebo tests as early as 1834, although they still had no concept of experimental design. By the late 19th century, psychology was developing and we start to see the use of randomization, at first to explore sensory perception and to evaluate (bogus) supernatural claims like those made by psychics (e.g., talking to the dead). Experimentation moved forward again in pharmacology, in part because of Charles Edouard Brown-Sequard’s claims that testicular extract from guinea pigs would “rejuvenate mental and physical health.” The scientific community, now increasingly skeptical of claims made without evidence, started still rather primitive assessments within a few months. Finally, by the mid-1930s, we obtained what many scientists think of today as the randomized controlled trial, made possible largely by Ronald Fisher in his famous, “The Design of Experiments.” While not mentioned by Kaptchuk, experimental design today has made other important leaps forward, most of which are unfortunately not internalized in computer science like they are in other disciplines (e.g., studies on replication, registered randomized controlled trials). Walter Tichy has probably discussed this more than most. Stefik and E. Gellenbeck. Empirical studies on programming language stimuli. Software Quality Journal, 19(1):65-99, 2011. 10.1007/s11219-010-9106-7. Some problems became obvious. Surveys showed words like “for, while, or foreach” were, in a bizarre and unexpected twist of irony, the three least intuitive choices for people in our sample (which we later replicated). This is ironic because these choices are common across a large number of programming languages. Andreas Stefik, Susanna Siebert, Melissa Stefik, Kim Slattery. An Empirical Comparison of the Accuracy Rates of Novices using the Quorum, Perl, and Randomo Programming Languages. Workshop on the Evaluation and Usability of Programming Languages and Tools (PLATEAU 2011). Portland, OR, October 24th, 2011. Andreas Stefik and Susanna Siebert. 2013. An Empirical Investigation into Programming Language Syntax. ACM Transactions on Computing Education 13, 4, Article 19 (November 2013), 40 pages. Interestingly, in this new study, the same result we saw with Perl we also observed with Java, a programming language so popular it is used in the Computer Science A – AP test in high school. Ultimately, using a technique we call Token Accuracy Mapping, which is basically a way to figure out which tokens may have caused the problems, it appeared that C-style syntax was plausibly the culprit. At the same time, using this new technique, we found a variety of problems with Quorum and borrowed from languages where the evidence showed they had a better design (e.g., Ruby’s if statement design, with the exception of the equality syntax ==, was integrated into Quorum 1.7). Andreas Stefik and Stefan Hanenberg. 2014. The Programming Language Wars: Questions and Responsibilities for the Programming Language Community. In Proceedings of the 2014 ACM International Symposium on New Ideas, New Paradigms, and Reflections on Programming & Software (Onward! 2014). ACM, New York, NY, USA, 283-299. Now to be clear, Evidence-Oriented Programming is a paradigm, not a language, and the scholar Stefan Hanenberg in Germany thought it up at basically the same time. He came to the same conclusions I did for different reasons, with different experiments, on a different part of the globe (his story on the topic is very different from mine and fascinating). Others are fleshing it out better than I have, especially the scholar Antti-Juhani Kaijanaho, who has created what is perhaps the most systematic review of the history of the programming language wars ever. More crucially, it is a paradigm because the evidence on various design decisions (which I won’t get into here, but have written about extensively) is tricky to understand and requires significant statistical expertise to grasp. It also appears that some design decisions have trade-offs, the most well known of which to-date is that whether functions in programming contain type information (e.g., an integer, a number) appears to improve productivity of those past the third year of experience in college, but has a small, but non-zero, negative impact on novices at around a freshman year of college (depending on where in a program it is). In other words, I can imagine one language designer using evidence to optimize human factors for one group, while another optimizing for another, with both taking all known controlled trials into account and therefore having some similarities in their design. As a simple example, a block language designer hypothetically designing for a child’s toy or learning might use the word “repeat” for iteration, which the evidence supports, yet a text-based language designer might use the same word when designing for industrial scale robotics or a NASA rocket where blocks might be impractical and where efficiency of the language is crucial (or some other reason). This type of thinking could provide increased consistency amongst language designs in the years to come, with an increasingly stronger foundation of evidence. In any case, evidence-oriented programming is not a panacea, nor does it imply we will eventually get to the unlikely idea of “one language to rule them all.” Plausibly, what we are observing today is a paradigm shift in language design, going from next to no evidence at all on human factors toward an unwillingness of young scholars like myself to accept anecdotes or prestige as fact, for a basically similar reason Benjamin Franklin didn’t in the 18th century. No one knows where the evidence-oriented movement will end up, perhaps with some complex hybrid of blocks or visualization, or maybe with different domains having various kinds of approaches, or maybe even partial standardization of some aspects of language design within a century (or two). Wherever it ends up, the goal is to follow the evidence wherever it leads in order to make the next generation of programming technologies just as practical at industry scale, while also being easier to understand and use. Less than a week to go before I can start looking at the submissions for CSTA 2016. The submission deadline is October 1! If you are reading this you probably teach computing. You probably also have (at least) one special practice or bit of curriculum, or general teaching approach that you think works really well for you. That it works well for you means it is worth sharing with other computing teachers at CSTA 2016. We’ll be meeting next July 10-12 in sunny San Diego! Submitting a proposal is easy. Just go to the conference portal (https://www.softconf.com/h/csta2016/), click the “HERE” link in the “For authors:” section, read the legal stuff about expectations, and start entering your proposal. You can check the system out without having to sign up or anything. (I always look at the information they want and write it up in a text editor, then copy and paste it into the web page.) I can’t guarantee your proposal will be accepted but it certainly will get serious consideration. You might also consider volunteering to review submissions. That goes double for folks who have attended CSTA some time in the past. To volunteer to become a reviewer, please complete the following form: http://goo.gl/forms/xc5UAbFMd7 by September 27. If you have questions, please contact: submissions@csta-hq.org. I’ve had the privilege of being involved in the planning of all the CSTA conferences. Back in the old days a bunch of knowledgeable people and I would get together and identify topics and speakers, which is impossible with the size of the conference today. It would also make for a less diverse, energetic, and useful to participants conference than we get with proposal submissions and peer review. So, please consider submitting a proposal or volunteering to review. You can propose a 20-minute session, a 60-minute session, a 3-hour workshop, or a birds-of-a-feather. I look forward to seeing your proposal! The Computer Science Teacher Association’s Executive Director, Mark Nelson was recently featured in MediaplanetUSA’s “Careers in Digital Tech” campaign to inspire students to pursue careers in digital tech. The campaign highlights companies that are evolving and hiring the next great tech professionals. Providing tips and advice on the best path to take in order to be successful in digital careers from industry professionals themselves. The campaign was distributed in a centerfold of USA Today on September 4, 2015, and can also be viewed here: http://www.educationandcareernews.com/career-development/computer-science-dictating-careers-in-digital-technology.